The Orpheum Theatre located in Sioux City, Iowa, is a performing arts center and is home to the Sioux City Symphony Orchestra. Originally it was a Vaudeville and movie palace when the venue opened its doors in 1927 with a seating capacity of 2,650. In 1999 the facility was carefully restored, placing great care on restoring the original Wurlitzer Pipe Organ. The restoration took two years to complete and has since been a popular spot for tourists and locals alike. It features stunning chandeliers and beautiful hand carved detailing inlaid into the walls. 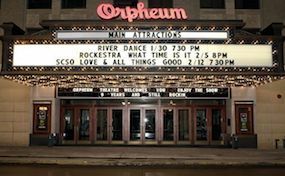 The Orpheum Theatre in Sioux City\’s Box Office is located at 5228 Pierce Street, Sioux City, Iowa. Oprheu.TheatreSiouxCity.com is not associated with any primary supplier, box office, website, venue, and or promoter. We are a privately owned and operated business specializing in sales in the resale secondary market. Prices on our sites are often above face value but will change quickly with market conditions. To buy tickets for any Orpheum Theatre Sioux City events simply click on the event of interest or call our operators at anytime.